Conan the Barbarian is, perhaps, the most famous barbarian in all of fiction, thanks in part to his numerous appearances in the most unlikely of places. 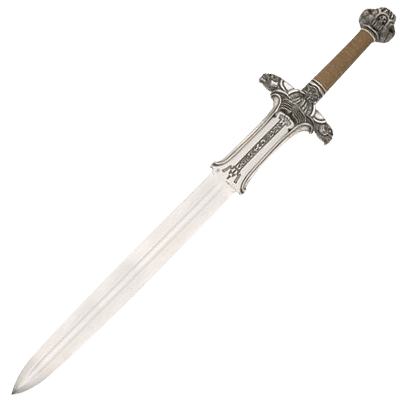 And to recognize this, we offer the Silver Conan the Barbarian Atlantean Sword by Marto. This faithful reproduction of Conans Atlantean Sword combined with a level of roughness which was inspired from the movie, Conan the Barbarian. 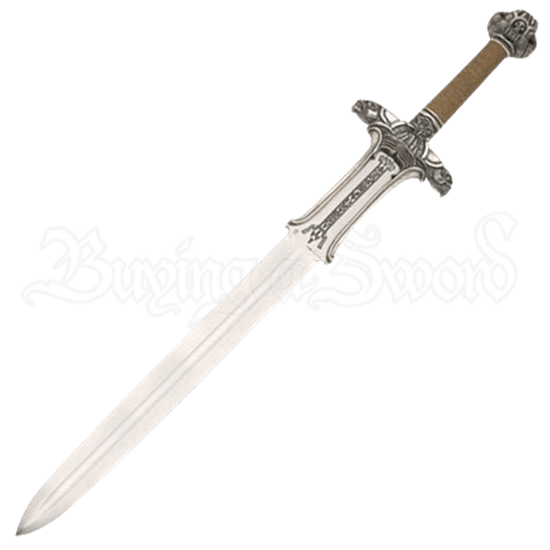 This sword derives much of his appeal from the simple ruggedness of the sword, as well as the detailing and the finish applied to the sword. The pommel is representative of a human skull and the silver-plated guard displays a strange, yet intimidating double-headed serpent, while the grip is wrapped in a rustic rope, just as it was originally. The steel of the blade is deeply engraved with the original runes that decorated the blade on its first appearance. Perfect for collectors and Conan enthusiasts alike, the Silver Conan the Barbarian Atlantean Sword by Marto is a beautiful weapon that is as rugged and deadly as it is visually appealing.